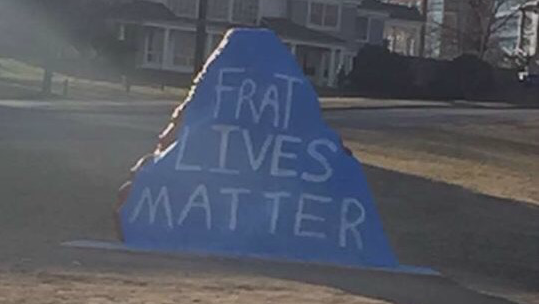 STORRS, Conn. -- The governing council for several University of Connecticut fraternity chapters is denouncing “Frat Lives Matter” messages spray-painted on so-called spirit rocks on campus. WVIT-TV reports UConn’s Interfraternity Council says the “Frat Lives Matter” messages were found on rocks throughout the university’s Storrs campus Monday. The incident comes days after six Kappa Sigma fraternity members were charged with alcohol-related offenses related to the October death of 19-year-old Jeffny Pally. Police say Pally had been sitting against a garage door of the UConn Public Safety Complex when she was run over by a fire vehicle. She had attended a party at a fraternity-affiliated house earlier that night. CBS affiliate WFSB reported eyewitnesses told police the alcohol at the party was provided by the Kappa Sigma house, according to an arrest warrant. The fraternity recently lost its recognition and housing due to off-campus incidents unrelated to Pally’s death. Authorities say they don’t know who wrote the “Frat Lives Matter” messages. The rocks have since been repainted to include messages of unity.